RBTH highlights 2016’s most important art showcases. More than 150 works from the Russian Museum collection will take part in this retrospective dedicated to the 150th birthday of this artist, stage designer and illustrator. Bakst became famous for his theatrical sceneries when he collaborated with the illustrious Sergei Diaghilev on his ballet and opera performances in Russia, France, the U.S. and other countries. Bakst's costume and decoration sketches will form a big part of the exhibition. Ten years after a major Moscow exhibition, British sculptor and Turner Prize laureate Cragg is coming to Russia once again. One of the most vivid representatives of the New British Sculpture movement will now have a retrospective in the General Staff Building of the recently restored Hermitage, which has been configured for showcasing modern art. The exhibition will also contain his world-famous abstract figures with perplexed human profiles. The two Renaissance geniuses, Lucas Cranach the Elder and Lucas Cranach the Younger, have never been shown together in Russia. This is the first attempt to unite their subtle poetic work in one exhibition, which will include the masters' canvases, drawings and wood carvings from museums and private collections in Germany, Spain and Hungary. After Moscow the exhibition will move to the Hermitage Museum in St. Petersburg. The current director of the Tretyakov Gallery, Zelfira Tregulova, has longed to put on this retrospective of the works of one of Socialist Realism’s main artists for many years. And she has also been preparing it for many years, while simultaneously displaying Korzhev's works in her curatorial projects in Europe. The vision of the “big master,” as Tregulova calls him, will be exhibited in all its varying forms: from the heroic-patriotic themes of the 1950s to his almost surrealistic works of the 1990s. This large-scale project, uniting young artists under 35 years of age from all over the world, is being curated by the British art historian Nadim Samman. Samman also came up with the main theme for the Biennale: Deep Inside. The Biennale's principle project will be divided into two parts: one will be located at the Trekhgornaya Manufaktura, a former 19th-century industrial building with the other in a three-story branch of the Moscow Museum of Modern Art on Yermolaevsky pereulok. The Tretyakov Gallery is celebrating the 200th birthday of this famous Romantic painter a year in advance, which the world will commemorate on July 29, 2017. More than 150 paintings and drawings from Russian museums will make up the retrospective of this artist, who is best known for his maritime canvasses. Aivazovsky’s most important works will be included: from “The Rainbow” to “The Ninth Wave.” For the first time the public will see “Along the Shores of the Caucasus,” which is normally stored in the Tretyakov Gallery's annex. Without his public art projects it is impossible to imagine European cities today. 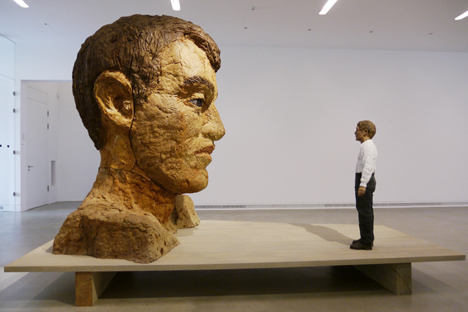 It seems that in each one you can find wooden sculptures that sometimes can be mistaken for real people. This exhibition in Moscow, which has been anticipated for three years, will unite sculptures and reliefs from the last 15 years of the artist's career, as well as new works inspired by Moscow. The Museum of Contemporary Art founded by Dasha Zhukova, the girlfriend of billionaire Roman Abramovich, will open yet another blockbuster show (the first being the exhibition of Louise Bourgeois). At its heart are giant drawings by the American artist and sculptor Robert Longo, executed in the style of photorealism, as well as sketches and films by Sergei Eisenstein and apocalyptic paintings and etchings by Francisco Goya. One of the most authoritative museums in its field, the Kyoto Costume Institute, which houses the largest collection of clothing and accessories from all over the world, will hold an exhibition at the Kremlin Museum for the first time. About 40 women's suits from the 1920s-1930s will be brought to Moscow, including those from the legendary Lanvin, Poiret and Chanel houses, as well as vintage Cartier and Van Cleef & Arpels jewelry. This exhibition promises to be an international sensation not only for its list of artists but because most of the works very rarely leave the walls of the Vatican. Among the highlights will be paintings by Raphael and Caravaggio, Giovanni Bellini, Guercino, Pietro Perugino, Guido Reni and Nicolas Poussin.